View photo gallery – To view a photo album, visit the District’s public Facebook page. You can view this photo album even if you don’t have a Facebook account. Providing its faculty with professional development is a priority for the Warwick Valley Central School District, which holds four Superintendent’s Conference Day sessions each school year. 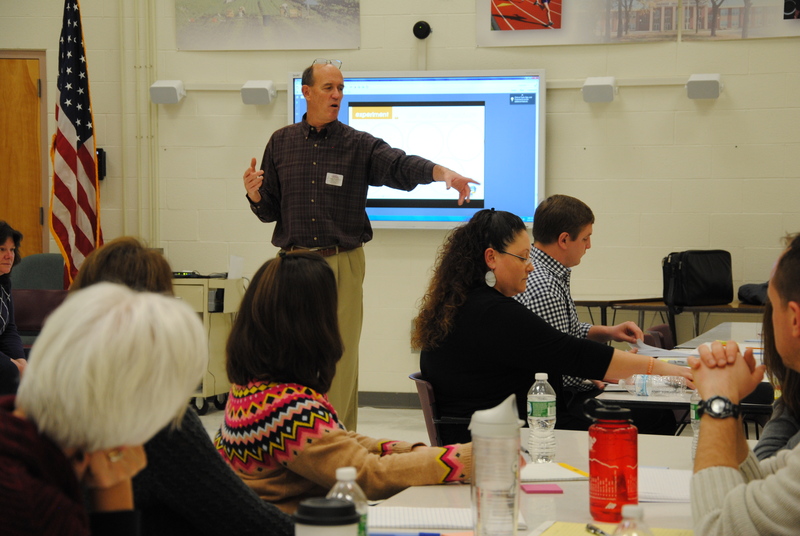 At Superintendent’s Conference Day on Thurs., Feb. 11, teachers participated in professional development sessions targeted to their specialty areas. Preliminary activities involved “Design Teams,” with faculty members collaborating to come up with a framework and ideas for #TheirFuture, a multi-faceted effort that will take place over 18+ months to help the district better prepare all students for their future. This initiative will allow the district to imagine, design and implement innovative programs and align resources in support of those programs. Summer Enrichment – This design team worked to innovate a summer enrichment program for Middle School children in grades 7-8 who need an intervention as they transition into 8th grade and the High School, respectively. The curriculum will be thematically based and differ from what students study during the regular school year. Online Gradebook – This design team worked toward creatively framing out the parameters for an online gradebook (grades 5-12). Instructional Rounds Conducted by Teachers – What if teachers visited classrooms with their colleagues, and looked at students and what they were learning? Building upon the administrative learning walks which have taken place in the district over the last two years, this design team will “hand the keys over” to teachers and ask…what should teacher walks look like? What do teachers value in the concept of learning walks? These walks will be designed for teachers by teachers. High School Common Assessments (grades 9-12) – To simplify and clarify grade-by-grade learning goals, including the “big ideas,” high school teachers worked on a plan toward designing common, high-quality student tasks in all subjects. Elementary Report Cards – With a focus on literacy, this design team began the process of revising the elementary report card. Student Leadership – Students involved in the student leadership academy devised ways to get feedback from parents, community members and other groups to help with the direction of the school district. ● Innovator’s Workshop – Planning for Innovators Workshop, a new program for HS juniors and seniors interested in entrepreneurship, or who have an innovative idea or solution to explore. Innovators Workshop combines three high school course disciplines into one of three groups of courses, depending on the student’s interest.